Slimming World Diary: Quick Gym Sesh ..
Had a quick gym session this afternoon, and even though it was only 50 mins long, I feel better for having it. We usually stay for over an hour but time was restricted today. Started on the treadmill to warm up, I did 30 mins on there, while running collectively for 7 mins, moved over to bikes then finished off with some weight trainer, where I learn every time I have no upper body strength. For dinner tonight I cooked Hunters BBQ Chicken with Paprika Wedges. 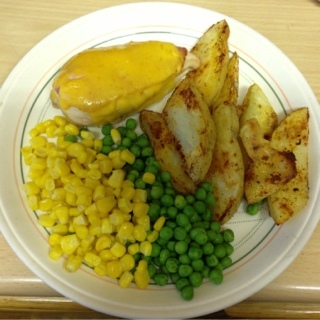 Syn free meal as I use the cheese as my Healthy A. Also I don't like BBQ sauce so I leave that off.